A public hearing will be held this Wednesday, Nov. 29, 7pm, in council chambers, on transfer of Herrontown Woods to Princeton. 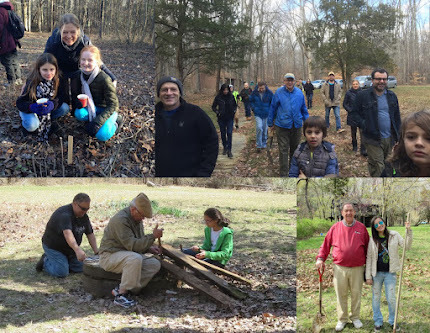 The Friends of Herrontown Woods (FOHW) has been restoring and maintaining trails and habitat in the preserve since 2013. We are encouraging members of the public to attend and speak in support of the transfer and FOHW's efforts to repair the Veblen buildings, and to thank town council for the support they are showing for FOHW's efforts. Written comments can also be sent to the address given in the public notice, below. Mercer County is transferring ownership of Herrontown Woods to Princeton municipality, 60 years after receiving the first 82 acres as a gift from Oswald and Elizabeth Veblen. Swayed by supporters of the Friends of Herrontown Woods (FOHW), the town decided to accept transfer of the Veblen buildings along with the land. Though the county is including $85,000 in case any of the buildings need to be demolished in the future, FOHW is negotiating with the town to lease and repair the historic structures. FOHW sees this transfer as a homecoming for what in 1957 was Princeton's first nature preserve. Though Herrontown Woods may well have been the first preserve donated to Mercer County, predating and possibly inspiring the creation of their Parks Commission, it is located at the far north end of the county, and in time the county shifted its interest and resources as it acquired other parkland more centrally located. Below is the online public notice with additional information. TAKE NOTICE that the County of Mercer has filed a request with the New Jersey Department of Environmental Protection, Green Acres Program, proposing to transfer ownership of certain parkland owned by the County of Mercer to Princeton. The parkland to be transferred, known as Herrontown Woods Block 2901 Lots 1&2, and Block 3001 Lot 7 & 8 consists of 143.5 acres and is subject to Green Acres restrictions.. Block 3001 Lot 11 containing 2.6 acres is currently under contract for county purchase. This lot will also be transferred to Princeton once acquired. The Green Acres restrictions on the parkland will be transferred with the parkland and will run with the property in perpetuity. Following the transfer, the property will continue to provide passive public access as a Princeton park. All information submitted by the County of Mercer and Princeton to the Green Acres Program in support of these requested parkland transfers are available for public inspection at 1) the Mercer County Planning Office 640 S. Broad St., Trenton NJ 08650 and on the Mercer County website www.mercercounty.org and 2) Administrator’s office Princeton Municipal Building 400 Witherspoon Street Princeton, NJ 08540 website www.princetonnj.gov . Any interested party is invited to appear at the hearing and provide public comment in accordance with the rules of the County of Mercer and Princeton. Written comments on the parkland transfer request may be directed to Mark Dashield Princeton Administrator at 609-924-5176 and Leslie Floyd, Planning Director, Mercer County at 609-989-6545. Please send a copy of any comments submitted on this request to the NJDEP Green Acres Program, and Bureau of Legal Services and Stewardship, Mail Code 501-01, P.O. Box 420 Trenton, NJ 08625-0420. Public comment on these parkland transfer requests will be accepted during the public hearing or until December 14, 2017. On or after February 27, 2018 the County of Mercer and the Princeton may each take formal action to approve the proposed transfer of parkland, subject to approval of the transfer documents by the Green Acres Program.